With the use of technology patients from all over world can benefit from the expert therapy offered by Dr Aazh’s clinic. 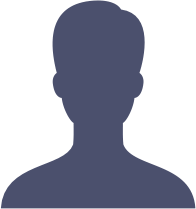 His past international patients were from the USA, Hong Kong, Japan, Dubai, Lebanon, Australia, Hawaii, Jersey, Scotland, Republic of Ireland, and many other countries. Receive expert treatment from the comfort of your own home. Save on time and travel expenses. Benefit from our out-of-hours and weekend sessions. Enjoy flexibility in mixing therapy over Skype with some face-to-face sessions in London or Guildford clinics if you like. I met with Dr. Hashir Aazh once and we continued the rest of the sessions via Skype which was just as excellent and still enabled me to take away the valuable tools I needed. Dr Aazh is very sincere and I have learnt so much about myself through these life changing sessions. Outstanding initial session. 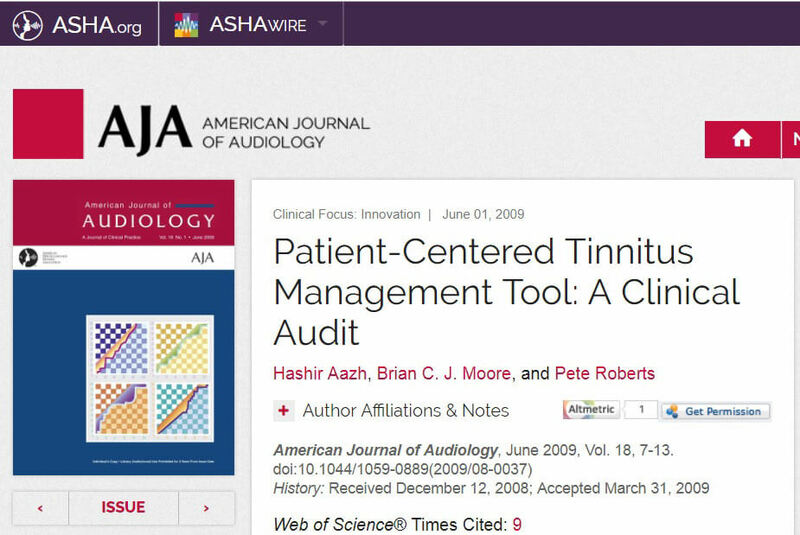 Dr.Aazh is clearly a skilled clinician with the ability to provide CBT type therapy from an audiologist’s perspective given his experience and thorough understanding of Tinnitus. Highly recommend his professional services via Skype. 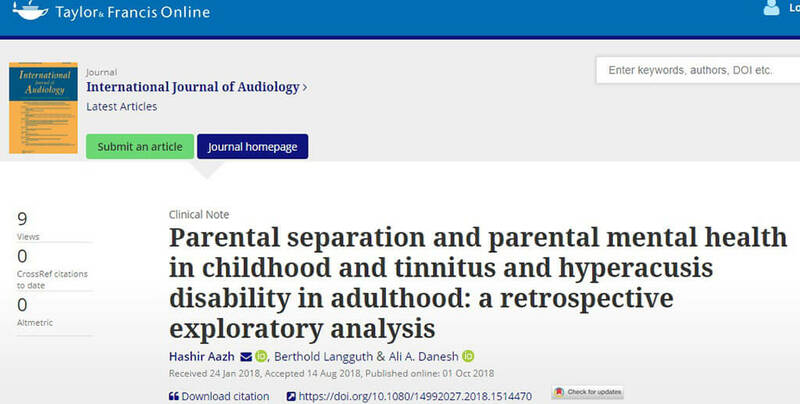 To explore the relationships between parental separation and parental mental health in childhood with tinnitus and hyperacusis disability in adulthood. The data for consecutive patients who attended a tinnitus and hyperacusis clinic in the UK over a six months period were included (n = 184). 14.7% of patients reported that while they were growing up, their parents were separated or divorced. There were no significant differences in Tinnitus Handicap Inventory (THI) and Hyperacusis Questionnaire (HQ) between patients with and without history of parental separation. About 40.2% reported history of mental health disorders in their parents. The scores on THI and HQ were worse in the group that reported mental health disorders in their parents (p < .01). Parental mental health illness did not significantly relate to THI, however, it was significantly related to the risk of hyperacusis (odds ratio [OR], after adjusting for age and gender: 2.05, p = .026). The adjusted OR for a subgroup of patients with a diagnosis of hyperacusis was 6.7 (p = .011), indicating a stronger relationship for this subgroup. Among patients seeking help for their tinnitus and hyperacusis, poor parental mental health was associated with increased hyperacusis disability. 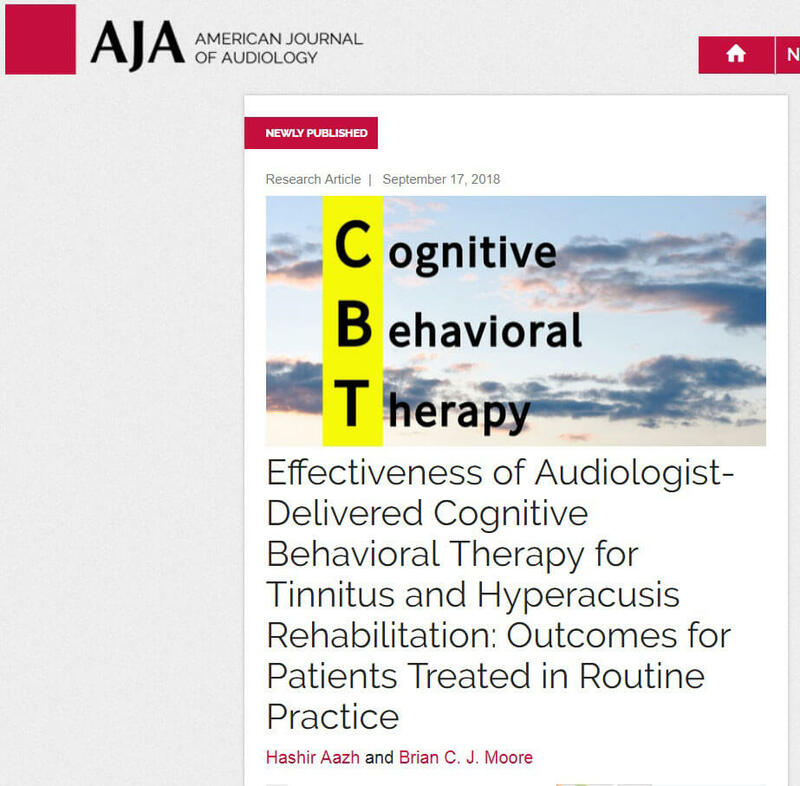 The aim was to assess the effectiveness of cognitive behavioral therapy (CBT) for tinnitus and/or hyperacusis delivered by audiologists working in the National Health Service in the United Kingdom. This was a retrospective study, based on questionnaires assessing tinnitus and hyperacusis and insomnia before and after CBT. Data were gathered for 68 consecutive patients (average age = 52.5 years) who enrolled for CBT. All measures showed significant improvements after CBT. Effect sizes for patients who completed CBT were 1.13 for Tinnitus Handicap Inventory scores; 0.76 for Hyperacusis Questionnaire scores; 0.71, 0.95, and 0.93 for tinnitus loudness, annoyance, and effect on life, respectively, measured using the Visual Analog Scale; and 0.94 for the Insomnia Severity Index score. An analysis including those who dropped out also showed significant improvements for all measures. Audiologist-delivered CBT led to significant improvements in self-report measures of tinnitus and hyperacusis handicap and insomnia. The methods described here may be used when designing future randomized controlled trials of efficacy. The aim was to assess factors related to tinnitus and hyperacusis handicap in older people. Data were gathered for 184 patients with an average age of 69 years. Tinnitus handicap as measured via the Tinnitus Handicap Inventory (THI) was significantly predicted by tinnitus annoyance as measured via the visual analogue scale (VAS) (regression coefficient, b = 2.9, p < 0.001) and the effect of tinnitus on the patient’s life as measured via the VAS (b = 3.9, p < 0.001). Hyperacusis handicap as measured via the Hyperacusis Questionnaire (HQ) was significantly predicted by the score on the depression subscale of the Hospital Anxiety and Depression Scale (HADS) (b = 0.8, p < 0.001) and to a small extent by the THI score (b = 0.07, p = 0.048). Insomnia scores as measured via the Insomnia Severity Index (ISI) were significantly predicted by scores on the depression subscale of the HADS (b = 0.46, p = 0.007). Since tinnitus annoyance significantly predicts tinnitus handicap, it is important to explore factors associated with annoyance that may be useful in designing appropriate rehabilitative interventions aimed at reducing tinnitus handicap in older people. Future studies should explore whether hyperacusis and insomnia in older people with tinnitus need to be managed in conjunction with treatment for depression. To assess the prevalence of hyperacusis and severe hyperacusis among children and adolescents seen at an audiology outpatient tinnitus and hyperacusis service. This was a retrospective study. Hyperacusis was considered as present if the average uncomfortable loudness level (ULL) at 0.25, 0.5, 1, 2, 4 and 8 kHz for the ear with the lower average ULL, which is denoted as ULLmin, was ≤77 dB HL. Severe hyperacusis was considered as present if the ULL was 30 dB HL or less for at least one of the measured frequencies for at least one ear. There were 62 young patients with an average age of 12 years (SD = 4.1 years, range 4-18 years). Eighty-five percent of patients had hyperacusis and 17% had severe hyperacusis. On average, ULLs at 8 kHz were 9.3 dB lower than ULLs at 0.25 kHz. For 33% of patients, ULLs were at least 20 dB lower at 8 than at 0.25 kHz. Among children and adolescents seen at an audiology outpatient clinic for tinnitus and hyperacusis, hyperacusis diagnosed on the basis of ULLs is very prevalent and it is often characterised by lower ULLs at 8 than at 0.25 kHz. 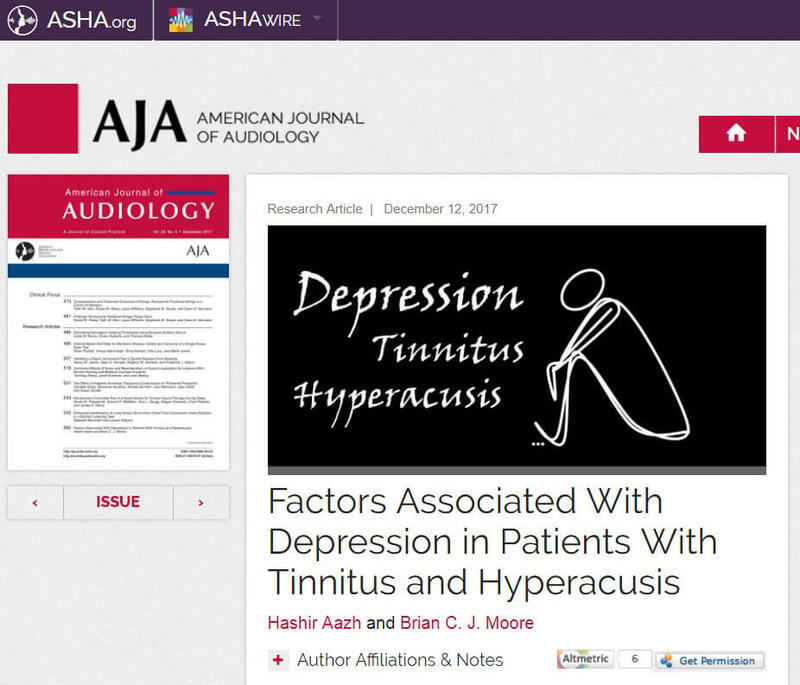 The purpose of this study was to assess factors associated with depression for patients with tinnitus and hyperacusis. Data were gathered from the records of 620 consecutive patients who sought help concerning their tinnitus or hyperacusis from an audiology clinic in the United Kingdom. One third of the patients had borderline abnormal or abnormal scores on the Depression subscale of the Hospital Anxiety and Depression Scale (HADS-D). Linear regression models showed that HADS-D scores were related to scores for tinnitus handicap, tinnitus loudness, and uncomfortable loudness levels. Mediation analyses showed that (a) the influence of tinnitus handicap scores on HADS-D scores was mainly mediated via the effects of insomnia, hyperacusis, and anxiety; (b) the influence of tinnitus loudness scores on HADS-D scores was fully mediated via the effects of tinnitus handicap, insomnia, hyperacusis handicap, and anxiety; (c) and the small influence of uncomfortable loudness levels on HADS-D scores was fully mediated by hyperacusis handicap and anxiety. Those involved in the management of patients with tinnitus and/or hyperacusis should use a wide range of instruments to assess the full impact of tinnitus on a patient’s life and should be prepared to refer a patient for treatment for depression, especially when the patient has anxiety, hyperacusis, and/or insomnia. The aims were as follows: (1) to explore patterns of uncomfortable loudness levels (ULLs) across frequency and their associated factors for patients with tinnitus and hyperacusis, and (2) to re-evaluate the criteria for diagnosing hyperacusis based on ULLs and scores for the Hyperacusis Questionnaire (HQ). 573 consecutive patients for whom ULLs had been measured were included. A good correspondence between the diagnosis of hyperacusis based on the across-frequency average ULL for the ear with the lowest ULLs (ULLmin) and hyperacusis handicap based on HQ scores was obtained with cut-off values of ULLmin ≤77 dB HL and HQ score ≥ 22. A regression model showed significant relationships between ULLmin and the score on the HQ and age. The mean HQ score for patients with a large interaural asymmetry in ULLs was significantly higher than for the remainder. Hyperacusis handicap was associated with strong across-frequency variations in ULLs. Appropriate cut-off values for diagnosing hyperacusis are ULLmin ≤77 dB HL and HQ score ≥22. Large interaural asymmetry and large across-frequency variations in ULLs are associated with higher HQ scores. The aim of this study was to assess the proportion of patients seen in a tinnitus and hyperacusis therapy clinic for whom presentation levels based on the British Society of Audiology (BSA)-recommended procedures for pure-tone audiometry and determination of uncomfortable loudness levels (ULLs) exceed ULLs, leading to discomfort during administration of these procedures. This was a retrospective cross-sectional study of 362 consecutive patients who attended a National Health Service audiology clinic for tinnitus and/or hyperacusis rehabilitation. For 21% of the patients, presentation levels based on the BSA procedure for pure-tone audiometry exceeded the ULL for at least 1 of the measured frequencies (excluding the first frequency tested, 1 kHz): 0.25, 0.5, 2, 3, 4, 6, and 8 kHz. For 24% of patients, the starting presentation level of 60 dB hearing level recommended for determination of ULLs exceeded the ULL for at least 1 frequency. 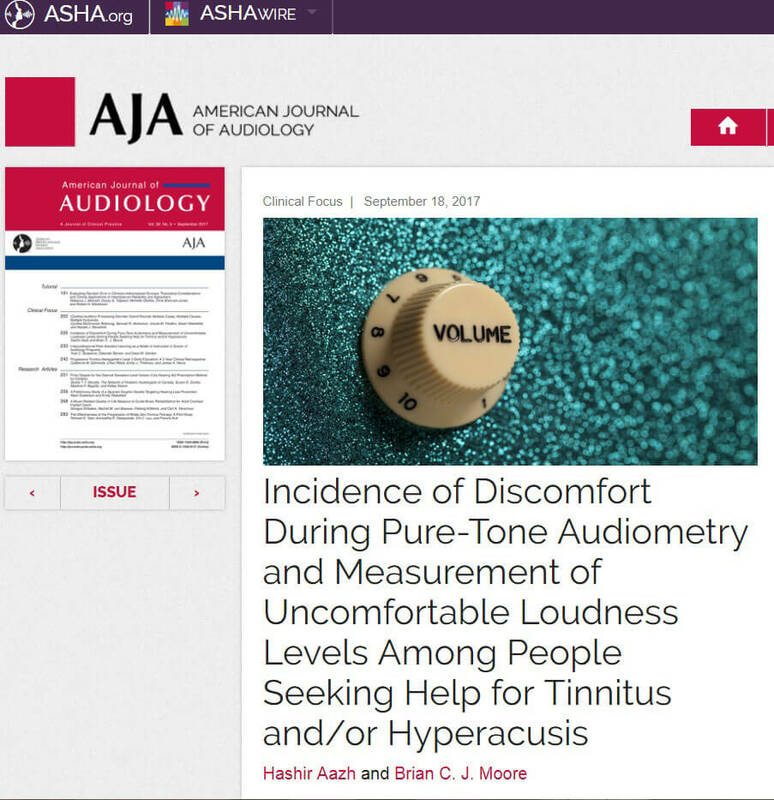 The starting presentation levels used for pure-tone audiometry and measurement of ULLs should be lower than those recommended by the BSA for people with tinnitus and hyperacusis. The objective was to determine the relevance and applicability of psychological questionnaires to patients seeking help for tinnitus and/or hyperacusis. This was a questionnaire-based survey. The following questionnaires were administered: Generalised Anxiety Disorder (GAD-7), Short Health Anxiety Inventory (SHAI), Mini-Social Phobia Inventory (Mini-SPIN), Obsessive Compulsive Inventory-Revised (OCI-R), Panic Disorder Severity Scale-Self Report (PDSS-SR), Patient Health Questionnaire (PHQ-9) and Penn State Worry Questionnaire-Abbreviated version (PSWQ-A). In addition, a patient feedback questionnaire was completed asking about the extent to which each questionnaire was relevant to them and how strongly they would recommend its use in the assessment of patients with tinnitus and hyperacusis. A total of 150/402 consecutive patients seen in a one-year period completed the questionnaires. 65% of patients had abnormal scores for one or more of the questionnaires. All questionnaires except the PDSS-SR were rated as relevant and recommended for use. The GAD-7, SHAI, Mini-SPIN, OCI-R, PSWQ-A and PHQ-9 are recommended for evaluation of psychological problems for patients seeking help for tinnitus and/or hyperacusis. Abnormal results on these questionnaires may indicate the need for referral for possible treatment of psychological problems. 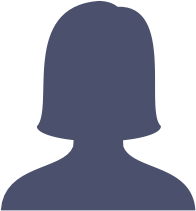 The aim was to determine the proportion and characteristics of patients who were offered, enrolled in and completed an audiologist-delivered cognitive behavioural therapy (CBT) programme for tinnitus and/or hyperacusis in a specialist Audiology Department in the National Health Service, UK. Data were gathered for 266 consecutive patients with an average age of 56 y (standard deviation =15 y). Following an initial assessment session, 68% of patients were judged to have problems sufficient for them to be offered audiologist-delivered CBT. The remaining 32% were discharged. Of those enrolled for CBT, 31% were discharged after the first CBT session, because they were judged to have insufficient tinnitus and/or hyperacusis distress. Of those offered continuing CBT, 45% declined to continue. Patients who continued were younger, had worse insomnia and had better hearing in their better ear than patients who declined. Of those who continued, 68% completed the six sessions of CBT. Although CBT is resource intensive, only 17% of the total patient sample received the full course of six sessions of CBT. Patients who accepted continuing CBT were younger, had worse insomnia and had better hearing than those who declined. 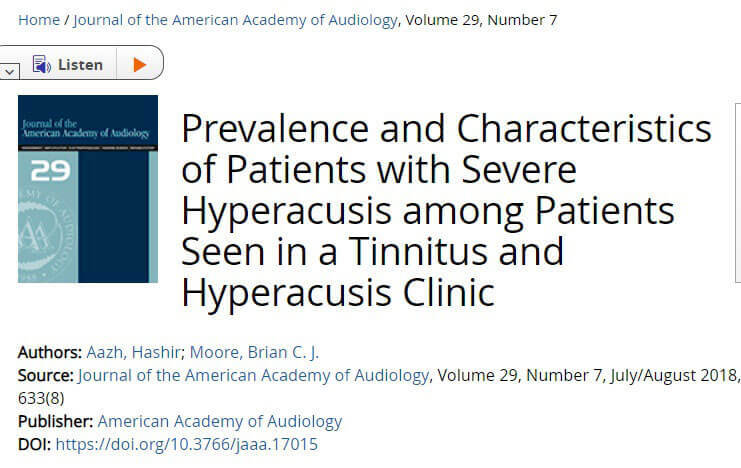 The purpose was to assess the proportion of patients seeking help for tinnitus and/or hyperacusis who have severe hyperacusis and to examine factors associated with severe hyperacusis. This was a retrospective cross-sectional study based on 362 consecutive patients who attended a National Health Service audiology clinic for tinnitus and/or hyperacusis rehabilitation and for whom uncomfortable loudness levels (ULLs) had been measured. The criterion for severe hyperacusis was taken as a ULL of 30 dB HL or less for at least one of the measured frequencies for at least one ear. Thirteen patients had severe hyperacusis, and eight of those had normal hearing. The lowest average ULL across frequencies was 28 dB HL. The difference in average ULLs between ears was 5 dB or less for nine patients. The range of ULLs across frequencies was between 5 and 60 dB, ULLs often being lowest at 8 kHz. Eleven patients had tinnitus, eight had otological abnormalities, twelve had mental health problems, and six were taking antidepressants. Severe hyperacusis is characterized by low ULLs for specific frequencies and no or mild hearing loss. Given the high incidence of tinnitus, otological abnormalities, and mental health problems, the management of patients with severe hyperacusis should involve otologists and psychiatrists in addition to audiologists. There are conflicting reports with regard to the relationship between suicidal ideations and tinnitus and hyperacusis. Audiology departments play a major role in offering therapy and support for patients experiencing tinnitus and hyperacusis. If suicidal and self-harm ideations among patients seen in audiology clinics are high, then it would be important to screen for them to make onward referrals to mental health services. The aim of this study was to assess the prevalence of and factors related to suicidal and self-harm ideations in patients with tinnitus and hyperacusis seen at an audiology outpatient service. This study was a part of a service evaluation survey using a correlational design. All patients who sought help concerning their tinnitus or hyperacusis from an audiology clinic of the National Health Service in the United Kingdom in a 1-yr period were asked to complete the survey questionnaires (n = 402). The focus of this article is on analysis of the patients’ responses about suicidal and self-harm ideations as measured via the Patient Health Questionnaire, item 9, and their associated factors. A total of 150/402 of patients answered the question about suicidal and self-harm ideations. Of these, 13% indicated that they had suicidal or self-harm ideations in the past 2 weeks. Suicidal and self-harm ideations were moderately correlated with scores on the anxiety and depression subscales of the hospital anxiety and depression scale. Suicidal and self-harm ideations decreased with increasing age. There were small statistically significant correlations between suicidal and self-harm ideations and tinnitus handicap, hyperacusis handicap, insomnia, and scores on the visual analog scale (VAS) of effect of tinnitus on life. The correlations between suicidal and self-harm ideations and gender, pure-tone average of the worse and better ears, uncomfortable loudness levels of the worse ears, and VAS of tinnitus loudness and annoyance were not statistically significant. A regression model showed that abnormal depression scores increased the chance of suicidal and self-harm ideations by a factor of 6.2 (95% confidence interval = 1.13-34.1, p = 0.036). 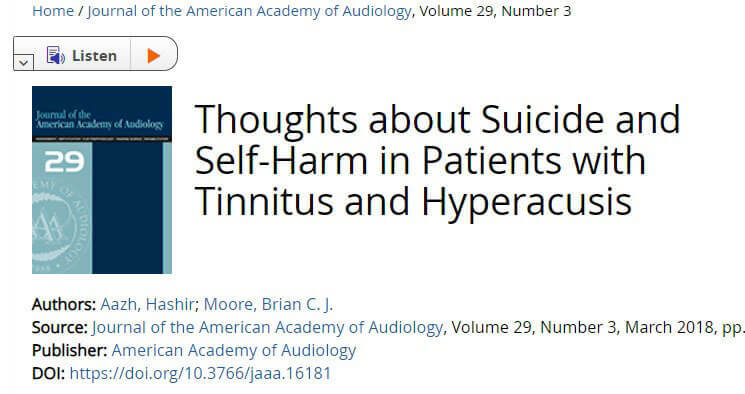 Audiologists offering tinnitus and hyperacusis rehabilitation should screen for suicidal and self-harm ideations among patients, especially for those with comorbid depression, and make onward referral to appropriate services when needed. Since the first description of tinnitus retraining therapy (TRT), clinicians have modified and customised the method of TRT in order to suit their practice and their patients. A simplified form of TRT is used at Ealing Primary Care Trust Audiology Department. Simplified TRT is different from TRT in the type and (shorter) duration of the counseling but is similar to TRT in the application of sound therapy except for patients exhibiting tinnitus with no hearing loss and no decreased sound tolerance (wearable sound generators were not mandatory or recommended here, whereas they are for TRT). The main goal of this retrospective study was to assess the efficacy of simplified TRT. Data were collected from a series of 42 consecutive patients who underwent simplified TRT for a period of 3 to 23 months. Perceived tinnitus handicap was measured by the Tinnitus Handicap Inventory (THI) and perceived tinnitus loudness, annoyance and the effect of tinnitus on life were assessed through the Visual Analog Scale (VAS). The mean THI and VAS scores were significantly decreased after 3 to 23 months of treatment. The mean decline of the THI score was 45 (SD = 22) and the difference between pre- and post-treatment scores was statistically significant. The mean decline of the VAS scores was 1.6 (SD = 2.1) for tinnitus loudness, 3.6 (SD = 2.6) for annoyance, and 3.9 (SD = 2.3) for effect on life. The differences between pre- and post-treatment VAS scores were statistically significant for tinnitus loudness, annoyance, and effect on life. The decline of THI scores was not significantly correlated with age and duration of tinnitus. The results suggest that benefit may be obtained from a substantially simplified form of TRT. To assess patients’ judgements of the effectiveness of the tinnitus and hyperacusis therapies offered in a specialist UK National Health Service audiology department. Cross-sectional service evaluation questionnaire survey. Patients were asked to rank the effectiveness of the treatment they received on a scale from 1 to 5 (1 = no effect, 5 = very effective). The questionnaire was sent to all patients who received treatment between January and March 2014 (n = 200) and 92 questionnaires were returned. The mean score was greatest for counselling (Mean = 4.7, SD = 0.6), followed by education (Mean = 4.5, SD = 0.8), cognitive behavioural therapy – CBT (Mean = 4.4, SD = 0.7), and hearing tests (Mean = 4.4, SD = 0.9). Only 6% of responders rated counselling as 3 or below. In contrast, bedside sound generators, hearing aids, and wideband noise generators were rated as 3 or below by 25%, 36%, and 47% of participants, respectively. The most effective components of the tinnitus and hyperacusis therapy interventions were judged by the patients to be counselling, education, and CBT. Abstract Background and Aim: The aim of this article was to critically discuss the clinical application of a cognitive behaviour therapy (CBT) protocol for the treatment of hyperacusis and its associated distress. Methods: Narrative review Recent Findings: Reviewing the research literature suggests that hyperacusis, anxiety and safety seeking behaviours may be linked. Therefore, it seems reasonable to suggest that clinical management of hyperacusis should also include addressing co-existing anxiety and avoidance behaviour. Although, there is strong evidence supporting the effectiveness of CBT in treating anxiety, the studies directly assessing the effect of CBT on hyperacusis are limited. 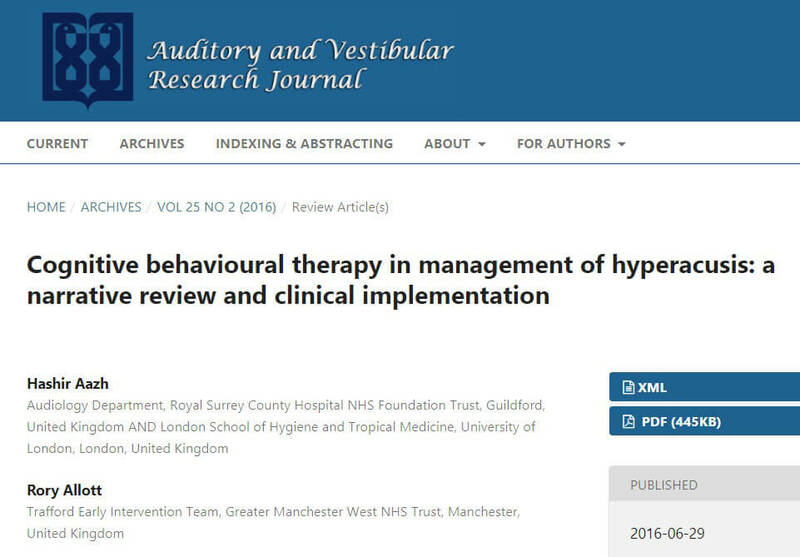 In this paper, the clinical implementation of a CBT protocol for hyperacusis rehabilitation is discussed. Conclusion: Although a causal relationship between anxiety and hyperacusis is not clear, there is a growing body of evidence suggesting a possible link between them. In the absence of a cure for hyperacusis, treatment of the anxiety component of the condition could be beneficial. Hyperacusis is a condition associated with irritation and discomfort from environmental sounds. A person with hyperacusis is bothered by sounds that are generally acceptable to others. Hyperacusis has been reported with people various pathologies as well as for people with no hearing loss or health condition. It is a common condition in children, especially children with Williams Syndrome, autistic spectrum disorder and tinnitus. The exact mechanisms underlying hyperacusis are unknown. However, it has been hypothesised that it may be a consequence of abnormally high gain applied by the central auditory system. Adverse emotional and behavioural reactions to the various sounds in the classroom may be experienced by school age children with hyperacusis. Audiological assessment and management of hyperacusis are briefly discussed in this article. 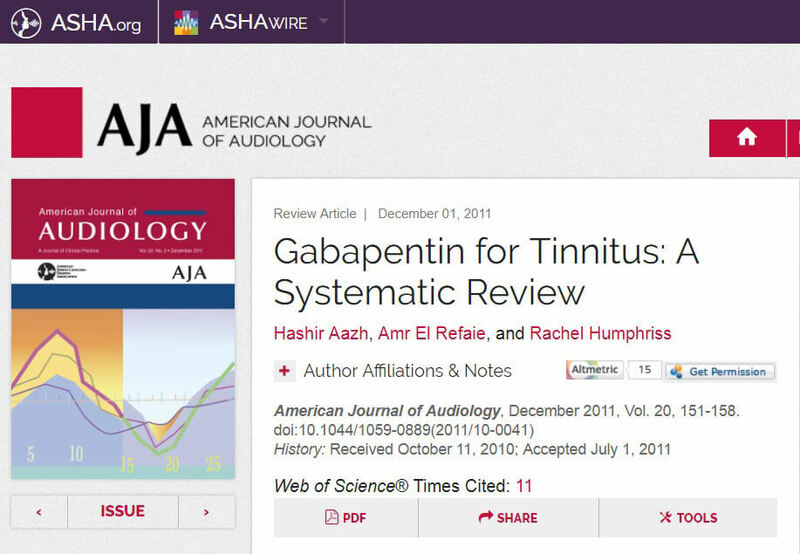 The main aim of this study was to assess the effect of gabapentin on tinnitus via a systematic review. An electronic search of literature as well as a hand search were conducted. Only double-blind randomized controlled trials (RCTs) that met all of the inclusion criteria were included in this review. The Cochrane Collaboration tool for risk of bias assessment was used to investigate the validity of the included studies. Meta-analysis was not appropriate due to inadequate details in reporting the data in the included studies. Hence, qualitative synthesis and interpretation of the data were carried out. Two studies that met the inclusion criteria were included in the review. Fourteen studies were excluded. There were substantive within-study clinical heterogeneities with regard to the baseline tinnitus handicap scores, duration of tinnitus, and severity of hearing loss in the included double-blind RCTs. The authors of both studies reported that gabapentin was not superior to placebo in their primary outcomes. However, following the assessment of risk of bias and within-study clinical heterogeneities, this review concludes that there is insufficient evidence regarding the effect of gabapentin on tinnitus. To evaluate the impact of an educational poster describing treatment options available to patients experiencing tinnitus. A patient-centered tinnitus management tool (PCTMT) was developed in the form of an educational poster that encouraged patients to decide how they wanted to deal with their tinnitus from the following options: (a) ignore the tinnitus and forget about it, (b) use a sound generator, (c) undertake tinnitus counseling with an expert, or (d) deal with the tinnitus using hearing aids (in the case of tinnitus and hearing loss). Fifty-five patients who were referred to the audiology department of a London hospital from the ENT department for tinnitus counseling were asked to read the PCTMT and to choose the option(s) that suited them the best. Forty-two percent of the patients wished to undertake counseling, 9% decided to try to ignore their tinnitus without help, 26% wanted to deal with their tinnitus with the help of a sound generator, and 24% decided to use hearing aids. The PCTMT reduced the number of patients who would otherwise have been referred for tinnitus counseling by 58%. This reduced the length of the waiting list and increased the time available for counseling of those patients who wanted it. Hyperacusis is intolerance of certain everyday sounds that causes significant distress and impairment in social, occupational, recreational, and other day-to-day activities. The aim of this report is to summarize the key findings and conclusions from the Third International Conference on Hyperacusis. The main topics discussed comprise (1) diagnosis of hyperacusis and audiological evaluations, (2) neurobiological aspect of hyperacusis, (3) misophonia, (4) hyperacusis in autism spectrum disorder, (5) noise sensitivity, (6) hyperacusis-related distress and comorbid psychiatric illness, and (7) audiologist-delivered cognitive behavioral therapy for hyperacusis. Implications for research and clinical practice are summarised. 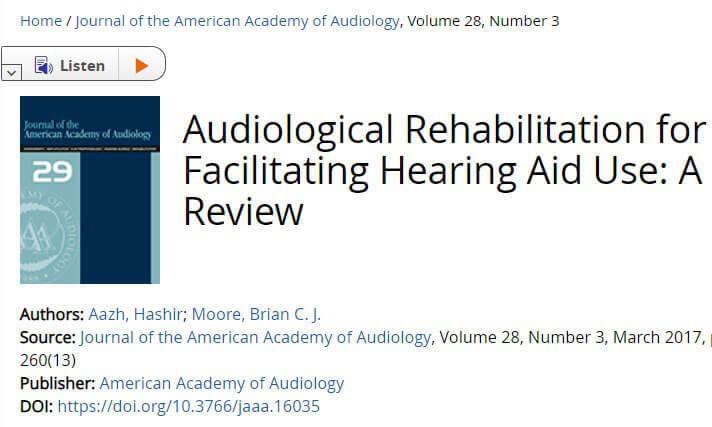 This article reviews and critically analyzes the design of studies on the effect of audiological rehabilitation (AR) programs on hearing aid (HA) outcomes, in order to guide future research. The design of this study was a narrative review. Studies were included in the review if they were randomized controlled trials that investigated the effects of AR on HA use and outcome between 2000 and 2016. Seven articles that met the inclusion criteria were included in the review. Most used educational rather than counseling approaches. Although educational AR programs seem to be useful in enhancing the use of communication strategies, there is limited evidence for their effect on HA use and self-perceived hearing handicap. More research is needed in this field. Future studies should (1) investigate the efficacy of AR interventions based on counseling and empathetic listening as opposed to or in addition to educational interventions, (2) use stricter criteria to include only a subpopulation of patients who do not get on well with their HAs, (3) measure the amount of HA use via data-logging and self-report questionnaires, and (4) use a matching comparison intervention for patients in the control group. The aim of this study was to evaluate the feasibility of conducting a randomized controlled trial (RCT) on the effect of motivational interviewing (MI) on hearing-aid use. This was a pilot single-blind, randomized parallel-group study conducted in the UK. Thirty-seven adult patients who reported using their hearing aid(s) less than four hours per day were randomized to MI combined with Standard Care (MISC) (n = 20), and Standard Care only (SC) (n = 17). Of 220 patients invited, 37 were enrolled giving the recruitment rate of 17%. One participant withdrew giving the retention rate of 97%. It was feasible to combine MI with SC for facilitating hearing-aid use and deliver the intervention with high fidelity in an audiology setting. The measure on hearing-aid use (data logging) one month after interventions favoured the MISC group. This pilot study suggests that conducting an RCT on using MI for facilitating hearing-aid use in people who do not use their hearing aids is feasible, and that MI combined with SC may have more positive effects on hearing-aid use compared to SC only. The aim of this study was to investigate the rate of and factors contributing to non-adherence to hearing-aid use in the UK National Health Service. A cross-sectional postal questionnaire survey. A questionnaire, including the International Outcome Inventory for Hearing Aids, was sent to all patients fitted with hearing aids at the Royal Surrey County Hospital between 2011 and 2012 (N = 1874). A total of 1023 questionnaires were completed and returned (response rate of 55%). A total of 29% of responders did not use their hearing aids on a regular basis (i.e. used them less than four hours per day). Non-regular use was more prevalent in new (40%) than in existing patients (11%). Factors that reduced the risk of non-regular use included bilateral versus unilateral amplification, and moderate or severe hearing loss in the better ear. 16% of responders fitted with bilateral amplification used only one of their hearing aids. The level of non-regular use of hearing aids in NHS found in this study was comparable to those for other countries. Additional support might be needed for patients at a higher risk of non-regular use. 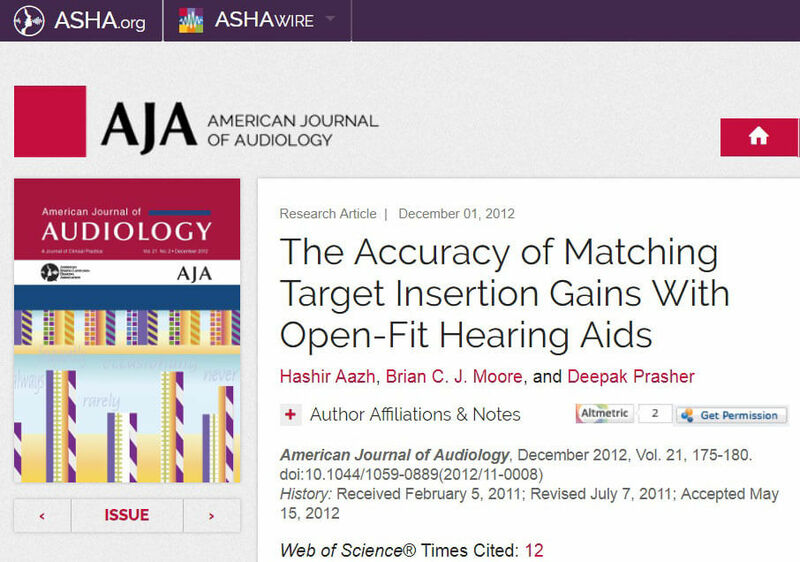 To assess the accuracy with which target insertion gains were matched for a single type of open-fit hearing aid, both on initial fitting and after adjustment. The hearing aids were fitted using the first-fit setting in the programming software and the target formula was selected as NAL-NL1. The difference between the real ear insertion gain (REIG) and the NAL-NL1 target REIG was recorded. The initial fitting was considered acceptable if the difference was less than 10 dB at all frequencies. If an initial fitting was not acceptable, the frequency-gain response was modified. The difference between the final REIG and the NAL-NL1 target REIG was recorded as final target mismatch. Of the 51 initial fittings, 36 (71%) failed to achieve a match within ±10 dB of the NAL-NL1 insertion gain target at 1 or more frequencies between 0.25 and 4 kHz. After the authors adjusted the frequency-gain response of the hearing aids, only 9 fittings (18%) failed to achieve a match. These outcomes suggest that target insertion gains for the open-fit hearing aids used here are rarely achieved with a first fitting but can usually be achieved through adjustments based on REIG measurements. The aim of this study was to assess differences between real ear insertion gains (REIG) measured with the modified pressure concurrent equalization (MPCE) and modified pressure stored equalization (MPSE) methods for open fittings in a typical audiology patient population. REIGs were compared for the two methods using a warble tone sweep at 65 dB SPL. The differences between the two methods at 0.25, 0.5, 1, 2, 3, 4 and 6 kHz were recorded. Eighty-three ears of a consecutive sample of 48 candidates for open-fit hearing aids were included. The mean difference between MPSE and MPCE REIGs was less than 1 dB at all frequencies. Analysis of variance showed that the main effect of method was not significant, and there was no significant interaction between method and frequency. The results for the MPSE and MPCE methods did not differ significantly for the patients with mild-to-moderate hearing losses tested here, for whom REIGs were generally less than 20 dB. Further research is needed to identify the REIG values at which the differences between MPCE and MPSE methods become clinically significant. The main aims of this study were: (1) to determine whether routine real ear insertion gain (REIG) measurement is necessary in fitting digital hearing aids; and (2) to assess the extent to which modifying the frequency-gain response of an aid can lead to better matches to the target in cases where the target gain was not initially achieved. The target formula was selected as NAL-NL1 in the programming software of four types of digital hearing aids. REIG measurements on 42 ears showed that 64% of cases failed to come within +/-10 dB of the target at one or more of the following frequencies: 0.25, 0.5, 0.75, 1, 1.5, 2, and 4 kHz. After adjusting the frequency-gain response of the aids, based on the REIG results, 83% of cases came within +/-10 dB of the target. The target was met more often, both before and after adjustment, for aids with seven gain “handles” than for aids with four gain “handles”. The results indicate that REIG measurements can and should be used to achieve more accurate fittings but that accurate adjustments are difficult with some aids. The aims of this study were (1) to investigate the prevalence of dead regions (DRs) at 4 kHz in elderly people with hearing loss and (2) to determine the extent to which the presence/absence of a DR can be predicted from the absolute threshold, the slope of the audiogram, or the pure-tone average (PTA) hearing loss at 0.5, 1, and 2 kHz. DRs were assessed for 98 ears with absolute thresholds between 60 and 85 dB HL at 4 kHz using the threshold equalizing noise test. Thirty-six ears had a DR at 4 kHz. There was no statistically significant difference in the slope of the audiogram or PTA between ears with and without DRs. However, the mean absolute threshold at 4 kHz was significantly higher for the group with DRs than for the group without DRs. The prevalence of DRs exceeded 50% for hearing losses greater than 70 dB. The effect of air pressure change on bone conduction (BC) hearing thresholds in the occluded ear was investigated. The pump manometer system of an impedance bridge was used to change the air pressure in the ear canal of twenty-two normally hearing subjects. BC thresholds were measured with: (1) open ear; (2) the ear canal occluded with a probe tube and application of 0 daPa air pressure; and (3) the ear canal occluded with a probe tube and application of 350 daPa air pressure. Thresholds were lower in condition 2 than in condition 1, the difference decreasing from 27 dB at 2500 Hz to 4.5 dB at 2000 Hz. Thresholds were higher in condition 3 than in condition 2. The results are interpreted in terms of changes in the relative contribution of the three routes of transmission for BC sound produced by occlusion and by a static pressure difference.